The 89th "Oz" Brigade ("Courage") is a brigade of the Israel Defense Forces (IDF), dedicated entirely to special operations. It was established on December 27, 2015. The new brigade, dubbed the Commando Brigade, is composed solely of infantry special-operations units removed from their previous chain of command structures to create a new tactical formation. 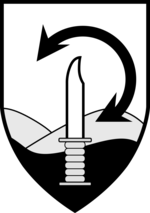 Commanded by Aluf Mishne (Colonel) Avi Blut, the brigade operates as part of the 98th Division. According to the IDF, the Commando Brigade is the brainchild of Lieutenant General Gadi Eisenkot and is the implementation of operational lessons learned during Operation Protective Edge in the summer of 2014 and the Second Lebanon War in 2006. According to the 98th Division Commander, the brigade is not only an integration of the elite teams of the Infantry Corps under one command, but also a body expected to lead operational and tactical thinking in order to establish a new warfare doctrine. The new Brigade, furthermore, is intended to provide special operations units a previously lacking centre of gravity. The concept of a commando brigade was developed by IDF Chief of Staff Gadi Eisenkot during the formulation of the 5-years military plan. The new brigade is said to draw further parallels between Israel's special forces and 75th Ranger Regiment. Other special-operations units, Sayeret Matkal, Shayetet 13, Shaldag, Oketz and Yahalom will continue to operate independently. The insignia chosen for the new brigade depicts the Hebrew letter Quf (ק), the first letter in the Hebrew word for Commando (קומנדו), composed of a commando knife rising from the sea and a double headed arrow above it. It symbolizes the special designation of the brigade and its mobility, by air land or sea. ^ Gabi Siboni and Gal Perl Finkel, The IDF Exercises in Cyprus and Crete, INSS Insight No. 945, June 28, 2017. ^ a b c d e Zeff, Michael (27 December 2015). "New Israeli Special Operations Infantry Brigade". Special Forces International. Tazpit News Agency. Archived from the original on 14 February 2016. Retrieved 14 January 2016. ^ a b c "Israel Stands Up New Commando Brigade". DefenseNews. 7 January 2016. Retrieved 14 January 2016. ^ Caspit, Ben (8 July 2015). "Is IDF gearing up to fight the Islamic State?". Al-Monitor. Retrieved 14 January 2016. ^ Zitun, Yoav (7 July 2015). "IDF to unite elite units in new commando brigade". Ynetnews.com. Retrieved 14 January 2016. ^ "IDF Commando Brigade unveiled amid threats from Nasrallah and Al-Baghdadi". A Sclerotic Goes to War. 27 December 2015. Retrieved 14 January 2016. ^ Gross, Judah Ari (28 December 2015). "IDF goes commando with formation of new elite brigade". The Times of Israel. Retrieved 14 January 2016. Wikimedia Commons has media related to Oz Brigade.